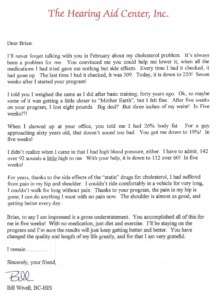 I’ll never forget talking with you in February about my cholesterol problem. It’s always been a problem for me. 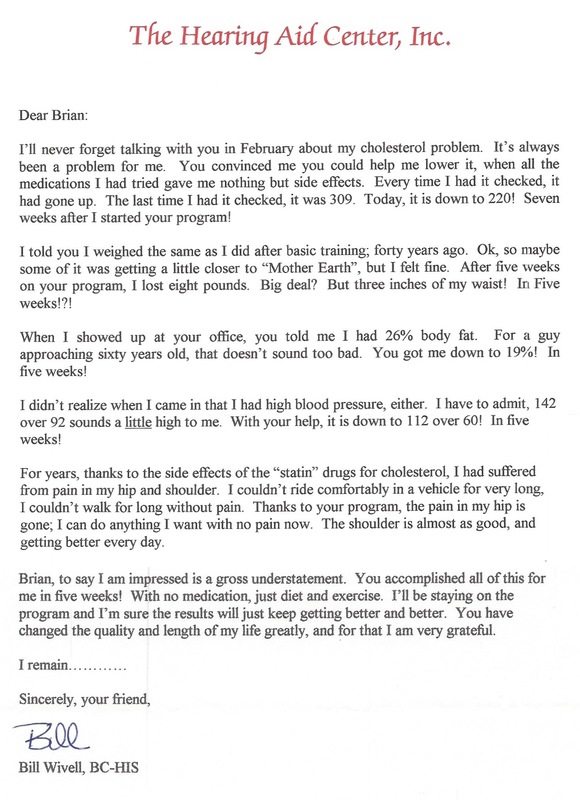 You convinced me you could help me lower my cholesterol, when all the medications I had tried gave me nothing but side effects. Every time I had my cholesterol checked, it had gone up. The last time I had it checked, it was 309. Today, it is down to 220! Seven weeks after I started your training program! I told you I weighed the same as I did after basic training; forty years ago. Ok, so maybe some of it was getting a little closer to “Mother Earth”, but I felt fine. After five weeks on your program, I lost eight pounds. Big deal? But three inches off my waist! In Five weeks!?! When I showed up at your office, you told me I had 26% body fat. For a guy approaching sixty years old, that doesn’t sound too bad. You got me down to 19%! In five weeks! I didn’t realize when I came in that I had high blood pressure, either. I have to admit, 142 over 92 sounds a little high to me. With your help, it is down to 112 over 60! In five weeks! For years, thanks to the side effects of the “statin” drugs for cholesterol, I had suffered from pain in my hip and shoulder. I couldn’t ride comfortably in a vehicle for very long, I couldn’t walk for long without pain. Thanks to your program, the pain in my hip is gone; I can do anything I want with no pain now. The shoulder is almost as good, and getting better every day. Brian, to say I am impressed is a gross understatement. You accomplished all of this for me in five weeks! With no medication, just diet and exercise. I’ll be staying on the program and I’m sure the results will just keep getting better and better. You have changed the quality and length of my life greatly, and for that I am very grateful.